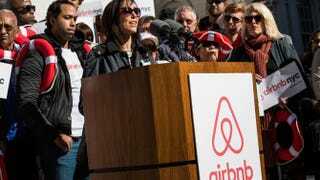 Linda Merlo, an Airbnb host from the Bronx, N.Y., speaks at a rally on the steps of City Hall showing support for the company Oct. 30, 2015, in New York City. A working paper (pdf) from Harvard Business School released Wednesday found “widespread discrimination” by hosts against people with black-sounding names seeking home rentals, reports the New York Times. The Times writes that fictional guests set up by three researchers "with names like Lakisha or Rasheed were roughly 16 percent less likely to be accepted than identical guests with names like Brent or Kristen." In July the researchers sent housing requests to about 6,400 hosts in five cities, including Baltimore, Dallas, Los Angeles, St. Louis and Washington. And renters with names that sounded black “got a positive reply about 42 percent of the time, compared with roughly 50 percent for white guests,” the report says. The results “are remarkably persistent,” the researchers wrote. Whites apparently discriminated against blacks, and blacks discriminated against blacks, with “both male and female users displaying bias,” writes the news outlet. The authors say that users should not be required to reveal their names. Airbnb currently requires all hosts to include profile pictures and urges its users to complete personal profiles.